V Tech 80-198900 - All aboard the learning express with the roll & roar animal train. Put the smart gears on the pegs to learn about animals. Pull the string to watch the gears move and turn together to enhance problem solving. Press the buttons to listen to different instruments or answer kid-friendly quiz questions. Move the slider to learn about different locations or press a button to learn about instruments or answer kid-friendly quiz questions. Be the conductor of your own adventure with gearbox roll & roar animal train by Vetch. Put the smart gears on the pegs to learn about animals. Mix and match the 15 gears to play with different combinations and create your own train. Let your child create their own unique train by mixing and matching the 15 included gears while strengthening their fine motor skills and problem solving techniques. 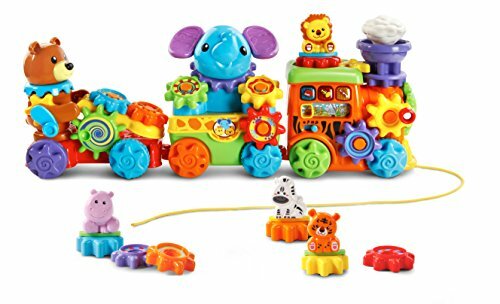 VTech GearZooz Roll & Roar Animal Train - Next stop is a new learning milestone for your little railway rider. Little ones can push the train or pull the string to watch the gears spin and move together. V Tech 80-175600 - Press the light-up button to learn about the mouse and hear fun stories. Go for a friendly spin with the GearZooz GearBuddies Lion & Mouse. Then, mix and match with other gearzooz playsets sold separately for more gear-rific fun! Connect the gears by adding the Smart Gear mouse, turn the handle to make them spin and the mouse will say fun phrases. Turn the handle gear to hear a melody, then turn the handle faster and faster to speed up the melody! Press the light-up button to hear fun stories, or roll the lion to hear playful sing-along songs. Turn the handle gear to hear a melody, then turn the handle faster to speed up the melody. Jam along to sing-along songs with the lion as you roll him and his mouse buddy around. VTech Gearzooz Gearbuddies Lion & Mouse, Yellow - Connect the smart gear mouse and turn the handle to watch the gears spin! Placing the mouse on the lion’s back triggers fun phrases and stories. Add a smart gear animal to the purple Smart Pole to hear a story about that animal. VTech 80-178600 - Jam along to sing-along songs with the lion as you roll him and his mouse buddy around. Move the slider to explore five interactive gear play modes: Colors & Numbers, Concert Time, Instrument Fun, Animal Jam Time and Guessing Game Time!. Five brightly colored piano keys introduce colors, numbers and musical instruments. Turn the table over and connect the 16 gears for mix and match creative play. Turn the handle gear to hear a melody, then turn the handle faster to speed up the melody. Turn the table over and use your creativity to connect and twist the gears! Connect the gears by adding the Smart Gear mouse, turn the handle to make them spin and the mouse will say fun phrases. VTech GearZooz 2-in-1 Jungle Friends Gear Park - Take a spin through the gearZooz 2-in-1 Jungle Friends Gear Park and jam with the animals. Place a friendly smart Gear animal on the stage to hear playful melodies and responses while watching an exciting light show. Five play modes keep your little one busy, and colorful piano keys introduce colors, numbers, instruments and more. Add a smart gear animal to the purple Smart Pole to hear a story about that animal. Press the light-up button to learn about the mouse and hear fun stories. Turn the gears on the 2-in-1 activity center to strengthen fine motor skills and explore cause and effect relationships while listening to music, songs and animal sounds. Turn the gears on the 2-in-1 activity center to hear music, songs and animal sounds. VTech 80-179100 - Turn the handle gear to hear a melody, then turn the handle faster to speed up the melody. Animal band button lets you play with the alligator from Zoo Jamz Guitar and the lion from Zoo Jamz Microphone each sold separately. Requires 2 aa batteries batteries included for demo purposes only; new batteries recommended for regular use; intended for ages 18 months to 4 years. Intended for ages 18 months to 4 years. The zebra piano has light-up keys so your little one can follow along or learn to play a song at three different levels to match their skill. The amplified microphone also lets kids sing along and hear their own voice. A microphone lets kids sing along and hear their own amplified voice; features 100+ songs, melodies, sounds and phrases. VTech Zoo Jamz Piano - Press the light-up button to learn about the mouse and hear fun stories. It has a whammy bar and scratch disc that enhance fine motor skills and add cool sound effects. Add a smart gear animal to the purple Smart Pole to hear a story about that animal. No matter what mode they choose, there's tons of fun packed into this musical toy. Jam along to sing-along songs with the lion as you roll him and his mouse buddy around. Move the slider to explore five interactive gear play modes: Colors & Numbers, Instrument Fun, Concert Time, Animal Jam Time and Guessing Game Time!. VTech 80-049741 - The pull toy is designed as a toddler toy for kids 1-3 years old; 2 AA batteries are included. Electronic learning toy features a removable CB radio that introduces colors, numbers, and musical learning. Add a smart gear animal to the purple Smart Pole to hear a story about that animal. Turn the gears on the 2-in-1 activity center to hear music, songs and animal sounds. Spin the three adorable Smart Gear animals on the stage to hear playful melodies and responses while watching an exciting light show. This 4-in-1 instrument lets your child choose to play the piano, violin, xylophone or saxophone with more than 20 songs and melodies; create, play and sing along. The zebra piano has light-up keys so your little one can follow along or learn to play a song at three different levels; whammy bar and scratch disc enhance fine motor skills and add cool sounds. VTech Pull and Learn Car Carrier Pull - Flip down ramp allows characters and cars to load onto the pull string car; press buttons introduce numbers, colors and animals. The small cars actually recognize each character when they're snapped into the driver's seat. Jam along to sing-along songs with the lion as you roll him and his mouse buddy around. Turn the handle gear to hear a melody, then turn the handle faster to speed up the melody. Vrrroom! get baby's brain going and growing with the Pull & Learn Car Carrier by VTech! Your toddler will be fired up to find three vehicles and three fun characters that fit nicely in the suped up car shaped carrier. Activity center is intended for ages 18 months to 4 years; 2 AA batteries are included for demo, use new batteries for regular use. V Tech 80-191100 - Education toy is interactive as the car is pulled along by your toddler; push toy includes 3 interactive animal and 3 interactive vehicles. Get your baby's brain going and growing with this educational and fun to use pull toy car playset. The pull toy is designed as a toddler toy for kids 1-3 years old; 2 AA batteries are included. Animal band button lets you play with the alligator from Zoo Jamz Guitar and the lion from Zoo Jamz Microphone each sold separately. Connect the caterpillar and learn! Requires 1 AAA battery battery included for demo purposes only; new battery recommended for regular use. Connect the gears by adding the Smart Gear mouse, turn the handle to make them spin and the mouse will say fun phrases. VTech Connect-a-Pillar - Electronic learning toy features a removable CB radio that introduces colors, numbers, and musical learning. Activity center is intended for ages 18 months to 4 years; 2 AA batteries are included for demo, use new batteries for regular use. Requires 2 aa batteries batteries included for demo purposes only; new batteries recommended for regular use; intended for ages 18 months to 4 years. Jam along to sing-along songs with the lion as you roll him and his mouse buddy around. Turn the gears on the 2-in-1 activity center to hear music, songs and animal sounds. Spin the three adorable Smart Gear animals on the stage to hear playful melodies and responses while watching an exciting light show. Press the light-up button to learn about the mouse and hear fun stories. V Tech 80-503100 - Activity center is intended for ages 18 months to 4 years; 2 AA batteries are included for demo, use new batteries for regular use. This 4-in-1 instrument lets your child choose to play the piano, violin, xylophone or saxophone with more than 20 songs and melodies; create, play and sing along. The zebra piano has light-up keys so your little one can follow along or learn to play a song at three different levels; whammy bar and scratch disc enhance fine motor skills and add cool sounds. Press the light-up button to learn about the mouse and hear fun stories. The pull toy is designed as a toddler toy for kids 1-3 years old; 2 AA batteries are included. Collect other smartpoint vehicles and connect to other Go! Go! Smart Wheels playsets sold separately to encourage your child’s creativity. VTech Go! Go! Smart Wheels Racing Runway Airplane - Jam along to sing-along songs with the lion as you roll him and his mouse buddy around. Turn the gears on the 2-in-1 activity center to hear music, songs and animal sounds. Spin the three adorable Smart Gear animals on the stage to hear playful melodies and responses while watching an exciting light show. Get your baby's brain going and growing with this educational and fun to use pull toy car playset. Education toy is interactive as the car is pulled along by your toddler; push toy includes 3 interactive animal and 3 interactive vehicles. Transforms from a cargo plane that holds up to two vehicles into a runway ramp that launches the included SmartPoint airplane; additional vehicles sold separately. V Tech 80-196700 - A microphone lets kids sing along and hear their own amplified voice; features 100+ songs, melodies, sounds and phrases. Watch them jam out to the beat of their own drum and create some sweet rockin' tunes! Connect the gears by adding the Smart Gear mouse, turn the handle to make them spin and the mouse will say fun phrases.
. Get your baby's brain going and growing with this educational and fun to use pull toy car playset. Transforms from a cargo plane that holds up to two vehicles into a runway ramp that launches the included SmartPoint airplane; additional vehicles sold separately. 4 segments have fun interactive features that include rattling beads, clicking sounds and tactile features; press the heart button or connect the segments to hear 50+ fun phrases, a spinner, songs and sounds. When pushed along the floor, feelings, the caterpillar wiggles and plays cute sounds and music to encourage crawling; heart button introduces colors, triggers phrases and plays music. Requires 1 aaa battery battery included for demo purposes only; new battery recommended for regular use; intended for ages 6 months to 3 years. Snap the colorful segments together in a variety of ways to create an interactive caterpillar; connecting the segments to the head trigger playful responses. Place the smartpoint airplane on two SmartPoint locations to hear different phrases, music and fun sound effects; teaches the letter a and the name of the airplane. VTech Zoo Jamz Stompin' Fun Drums - Encourage your little one to be a star while they enhance creative thinking and motor skills by tapping out beats and creating their own sounds using the included drumsticks! They will enjoy this fresh way to practice counting and develop coordination while following along with the melodies and sing-along songs! Four game modes let your child tap the drums to learn counting, catch the lights, follow the leader or create their own composition. Four game modes including counting, Catch the Lights, Follow the Leader and Free Style, encourage musical creativity and independent play. VTech--Import 80-049709 - Electronic learning toy features a removable CB radio that introduces colors, numbers, and musical learning. Works with other go! go! smart wheels, go! Go! Smart Animals playsets and select Go! Go! Smart Friends tracks each sold separately. Activity center is intended for ages 18 months to 4 years; 2 AA batteries are included for demo, use new batteries for regular use. A microphone lets kids sing along and hear their own amplified voice; features 100+ songs, melodies, sounds and phrases. Turn the handle gear to hear a melody, then turn the handle faster to speed up the melody. Snap the colorful segments together in a variety of ways to create an interactive caterpillar; connecting the segments to the head trigger playful responses. VTech Pull & Learn Car Carrier Frustration Free Packaging - Requires 2 aaa batteries batteries included for demo purposes only, new batteries recommended for regular use; intended for ages 1 to 5 years. And the pull & learn car Carrier revs him up for role-play fun. Four game modes including counting, Catch the Lights, Follow the Leader and Free Style, encourage musical creativity and independent play. Encourage your little one to follow along with the included 16 melodies, six sing-along songs and four drum styles or create their own beats. Requires 2 aa batteries batteries included for demo purposes only; new batteries recommended for regular use; intended for ages 18 months to 4 years. Vrrroom! get baby's brain going and growing with the pull & learn car Carrier! He'll be fired up to find THREE vehicles and three fun characters that fit nicely in the souped up car shaped carrier. VTech 80-505400 - Three animal characters are recognized when placed in the drivers seat. Move the slider to explore five interactive gear play modes: Colors & Numbers, Instrument Fun, Concert Time, Animal Jam Time and Guessing Game Time!. Five brightly colored piano keys introduce colors, numbers and musical instruments. Turn the table over and connect the 16 gears for mix and match creative play. The ball center features two interactive twisting slides that are filled with animals that will stop and start the balls or redirect the rolling. Move the seesaw up and down to trigger playful sounds and phrases, or press down to launch the balls onto the slides. VTech Pop-a-Balls Pop and Surprise Ball Center - Drum heads and cymbal light up when tapped for pattern and motor skills development. Add a smart gear animal to the purple Smart Pole to hear a story about that animal. This 4-in-1 instrument lets your child choose to play the piano, violin, xylophone or saxophone with more than 20 songs and melodies; create, play and sing along. The zebra piano has light-up keys so your little one can follow along or learn to play a song at three different levels; whammy bar and scratch disc enhance fine motor skills and add cool sounds. Turn the gears on the 2-in-1 activity center to hear music, songs and animal sounds. Spin the three adorable Smart Gear animals on the stage to hear playful melodies and responses while watching an exciting light show. Flip down ramp allows characters and cars to load onto the pull string car; press buttons introduce numbers, colors and animals. V Tech 80-502800 - Load the balls into the tower and press the big yellow button to send the balls up the tower, where they'll pop out the top and slide down the slides. Get your baby's brain going and growing with this educational and fun to use pull toy car playset. Add a smart gear animal to the purple Smart Pole to hear a story about that animal. Motion sensor for on the go fun. Move the seesaw up and down to trigger playful sounds and phrases, or press down to launch the balls onto the slides. Requires 2 aa batteries batteries included for demo purposes only; new batteries recommended for regular use; intended for ages 18 months to 4 years. Connect the gears by adding the Smart Gear mouse, turn the handle to make them spin and the mouse will say fun phrases. Press buttons introduce numbers, colors and animals. The ball center is intended for toddlers ages 9 months to 3 years old; 2 AA batteries are included for demo, use new batteries for regular use. Includes a variety of manipulative features that strengthen motor skills and teach the concept of cause and effect. VTech Pull and Sing Puppy - Snap the colorful segments together in a variety of ways to create an interactive caterpillar; connecting the segments to the head trigger playful responses. Four game modes including counting, Follow the Leader and Free Style, Catch the Lights, encourage musical creativity and independent play. Encourage your little one to follow along with the included 16 melodies, six sing-along songs and four drum styles or create their own beats.